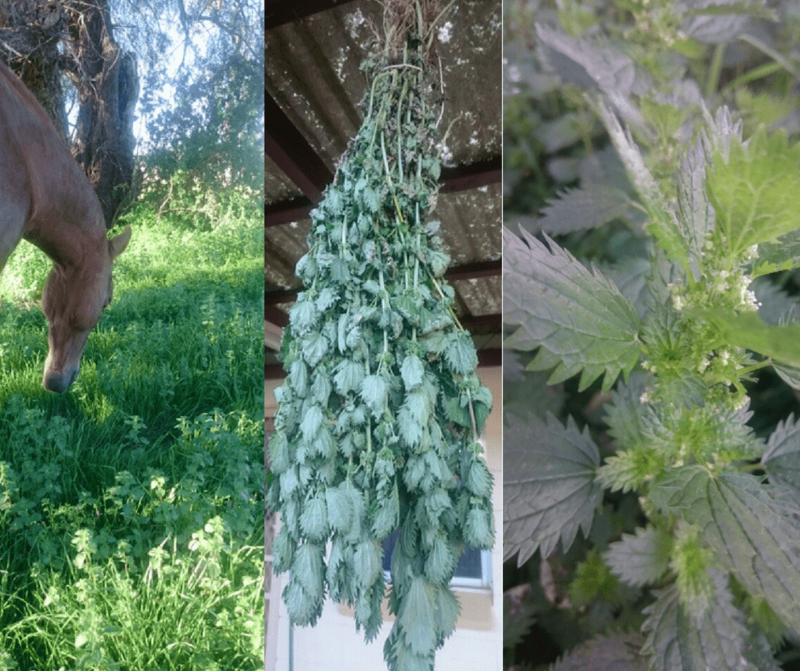 So many herbs are both food and medicine and Nettles are demonstrably one of the most valuable herbal medicines and feeds for horses. Let’s talk about the feeding aspect first. iron, cobalt, manganese, phosphorous, potassium, selenium, silica and niacin, thiamine, Vitamin A & Vitamin C, but low in sodium. I often add dried Nettles leaves to diets, because of the nutrients they offer, to provide some much needed Chlorophyll, especially where horses have no significant grazing, and/or no green hay such as lucerne, either due to lack of availability or it not being suitable for that individual. Chlorophyll is green blood, there is only one atom different in the molecules of chlorophyll and haemoglobin. The central atom in haemoglobin is iron and in chlorophyll is magnesium. Of course Nettles are also valuable for their highly bio-available Magnesium. And most importantly all green feeds contribute some Omega 3 fatty acids to the diet. Horses with osteo-arthritis and with metabolic disorders, also benefit enormously from Nettles in the feed, provided they are also receiving all the other essential nutrients recommended in the VF Natural Diet. The Nettle is a lively plant, and being a strengthening tonic to the whole body, can sometimes raise energy levels too much. Recently I had to remove Nettles from the diet of a Quarter Horse mare who responded this way and within 3 days of their being taken out, her normal energy levels returned. Nettles is a fabulous spring tonic and will hasten the shedding of the winter coat to reveal the new lustrous coat underneath. 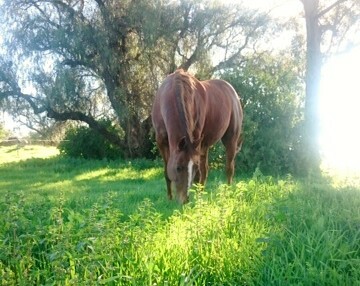 Horses will happily eat nettles in the paddock. Nettles as a herbal medicine for horses. I never use dried herbs as medicine, because I always use at least five herbs in a prescription, I can do this easily with liquid herbal extracts which are a potent medicine with a relatively small dosage and highly absorbable in this form. Nettles are an important ingredient in blood building mixes, such as my Iron Horse Formula, to treat anaemia or simply to boost the blood profile in performance horses. In this formula the action of Nettles is potentiated with Yarrow and Echinacea which stimulate red and white blood cell production and Red Clover for its high copper content. This formula is also helpful in resolving skin infections such as mud fever and greasy heel in conjunction with my Artisan Skin Healing Balm. Nettles always go into healing mixes for all injuries to stimulate the arterial circulation, usually with its metabolic partner Rue which stimulates the venous circulation, the two together providing a very safe balance. Whenever a body is lacking homeostasis, the circulation needs help, because it delivers nutrients into all the cells and removes waste products from them. When this vital function is disrupted as in illness and injury, healing cannot take place effectively. 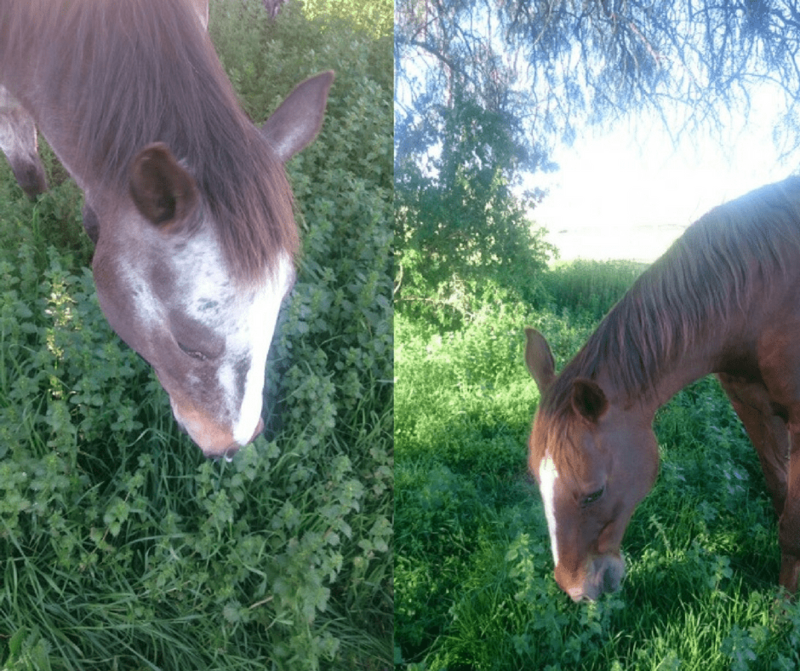 Laminitis is a vivid example of where the circulation is disrupted, so Nettles and Rue are needed to promote healing. Because Nettles also improves oxygenation of the blood, it works well as a preventative. 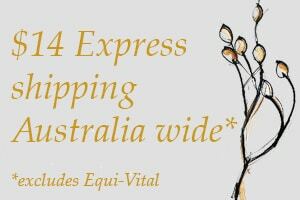 If you love your herbs like I do then Spring time is definitely a time full of anticipation as your gardens and paddocks will soon become a smorgasbord of natural healing potential. Your weeds are a truly valuable and most often overlooked natural resource that should be tapped into. Once you have learned to recognise and identify them you will soon discover those useful weeds are inexpensive, abundant and convenient and are growing all around you. No longer an unsightly nuisance plant but a potential herbal asset to your healing repertoire. Nettles grow on any nitrogen rich soil where animal excreta accumulates. Weeds are brilliant! They have a multitude of uses and I am most certain that if you are following Victoria’s diet and herbal guidelines you are already using them. Nettles are incredible herbs and to see them growing in your own paddock can certainly stir up some excitement. Like the eclectics that came before, you will soon discover that these plants are truly unique and deserve their place as herbal healers, but pickers beware they are not called stinging nettles for nothing!! My best advice is buy a decent pair of garden gloves, wear a long sleeved shirt, long trousers and boots, and proceed with caution as the nettle sting can smart. Nettles cream or ointment will take the sting away. Keep a pot on hand, and you can also make your own (see the recipe below). Nettles vary in their stinging intensity and as you can see from the photos on this page of my horses wading through them and eating them, these must be quite mild. Be prepared before you harvest. I usually lay out a couple of chaff bags nearby with some string for tying and carry a handy pocket knife. I don’t cut my nettle but gently pull it from near the base so as to gather the whole plant, roots and all. Once removed the plants can be placed on top of the each other and tied off in bunches. Groups of 6 to 8 plants is usually enough. Roll up chaff bags to carry. There are many ways to use your nettle, I choose to dry mine and depending on how much time or space I have I will most likely use one of three methods. The drying process removes the chemicals which cause stinging. Choose a dry, airy space such as under the veranda at home and hang your nettles from the roots on a line until dry. Remember to allow each bunch some much needed space for air circulation. Drying nettles this way can take a couple of weeks or so depending on the weather. Old screen doors make useful hangers as well. Spread your nettles on a flat drying surface out of the weather. Chaff bags come in handy for this too. Turn every couple of days or so until dry. For convenience I also use a dehydrator which reduces drying time to a couple of hours. There are a wide variety of inexpensive ones available. Store in an airtight container in a cool, dry place and your newly harvested nettles will last months. Don’t forget to label with name & date of harvest. Chop nettles and place in a heavy based saucepan with the olive oil on a medium heat. When the mixture begins to form bubbles reduce the heat and simmer the mix until any steam evaporates from your fresh herbs. If you are using dried herbs simmer very slowly and keep heat to a minimum as there will be no steam. When the bubbles are almost gone take the saucepan off the heat (don’t wait until bubbles are completely gone). Filter the mixture through a strainer lined with a ‘çhux’ into a bowl. Gently squeeze remaining oil from chux once cooled. Return the oil mix to a clean saucepan, add your beeswax and slowly reheat. When the beeswax has melted take the saucepan off the heat, cool slightly then pour into a bowl. Place the bowl into a larger bowl filled with cool water and stir with a wooden spoon. You will notice that the sides of the bowl will be coated with a harder layer of ointment. Take the bowl out of the water and stir in the firmer layers. Stir until the ointment becomes thick and has no lumps. Pour into labelled jars ( dark is best), seal and store in a dark place. Nettle ointment is very good for itchy skin conditions and being an ointment isn’t removed as easily as cream. The following summary is an extract from my book, The Complete Horse Herbal. Chlorophyll (very rich source), formic acid (causes stinging), histamine, iron, vitamin C, minerals – calcium, chromium, magnesium, zinc, cobalt, manganese, phosphorous, potassium, selenium, silica. Dried leaf or fresh leaves boiled for a few minutes or wilted to remove the stinging action, for use as a spring tonic or nutrient feed supplement. Extract of the leaf (often partnered with Rue, which is stimulant to the venous circulation) as part of a formula or prescription. Nettles being strengthening and tonic to the whole body may produce a very lively response! Can occasionally cause an itchy skin rash known as urticaria or nettle rash, from contact with the fresh plant. Would you like to learn more about useful herbs? If you’d like more information on herbs, download my full list of useful herbs. Copyright Victoria Ferguson 2016. Content may not be reproduced unless written permission is granted by Victoria Ferguson.